Democrats were nearly three times as likely to say Ivanka Trump’s private email use was a major problem compared with Hillary Clinton’s. Republicans were almost five times as likely to say the former secretary of state’s private email use was a major problem compared with the first daughter’s. When it comes to Democrats and Republicans, not all email “scandals” are created equal. 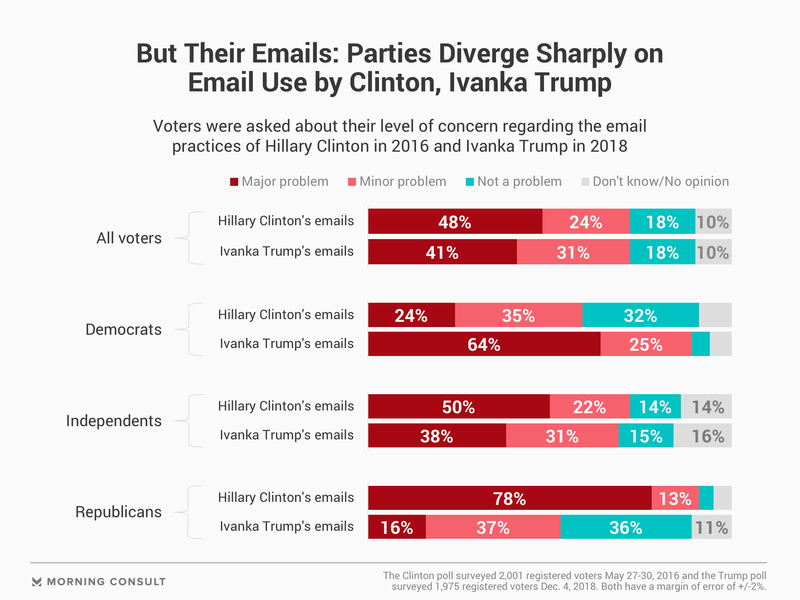 Two Morning Consult/Politico surveys that gauged the public’s reaction to administration officials’ use of private email to conduct government business – former Secretary of State Hillary Clinton and Ivanka Trump, a senior White House adviser and daughter of President Donald Trump – show partisanship to be the main driver of views. In the latest online survey, conducted Tuesday, 41 percent of registered voters said it was a “major problem” that Trump used a private email address for official business during the transition and for much of 2017, as The Washington Post reported last month. That level of alarm is slightly less than the 48 percent who said in a May 2016 poll that it was a major problem that Clinton, then a Democratic presidential candidate, had used a private email address on a personal server while serving as the nation’s top diplomat. Both polls’ margin of error is 2 percentage points. But among Republicans and Democrats, views on those situations diverged sharply. While 78 percent of Republican voters described Clinton’s use of private email as a major problem, 16 percent said the same was true for Trump. Among Democrats, 64 percent said it was a major problem that the first daughter used private email, compared with 24 percent in the 2016 poll who were similarly as concerned by Clinton’s actions. A similar effect persisted on questions of legality and ethics. Forty-six percent of registered voters said they believed it was illegal for Trump to use private email for government business, compared with 50 percent who said the same for Clinton. But 27 percent of Democrats said Clinton’s email practices ran afoul of the law, while 21 percent of Republicans called Trump’s use of private email for government business illegal. And while 58 percent of all voters in both surveys agreed that it was unethical for Clinton and Trump to use private email, responses among partisans were nearly mirrored and much kinder: One-third of Republicans said what Trump did was unethical, compared with 36 percent of Democrats who said the same for Clinton. The president’s eldest daughter has pushed back on any comparisons to Clinton. Last week, she told ABC News “there’s no equivalency to what my father’s spoken about” in reference to his criticisms of his 2016 Democratic opponent’s private email use. “All of my emails are stored and preserved. There were no deletions. There is no attempt to hide,” she said. Trump’s use of private email is unlikely to spawn as much media coverage as Clinton’s did in 2016, but it won’t entirely protect her from scrutiny either. Rep. Elijah Cummings (D-Md. ), who is set to become the chairman of the House Oversight and Government Reform Committee, has already said he plans to look into the matter. “My goal is to prevent this from happening again — not to turn this into a spectacle the way Republicans went after Hillary Clinton,” he said in a statement last month.